Film Review: ‘The Blackcoat’s Daughter’! We’ve seen our fair share of demonic possession movies over the past several decades with some standing out in the spotlight and scaring us for years on end. Then there is the other side of this coin where these demonic possession movies fall very short from making any kind of sense other than to produce cheap scares. That brings us to the movie ‘February‘ or as it’s being called now ‘The Blackcoat’s Daughter‘, written and directed by Oz Perkins, who is more an actor than a director, this being his directorial debut. ‘The Blackcoat’s Daughter‘ takes place in, well, February and centers around an all girl’s boarding school where all of the girls are going on some sort of February week break from school. A few girls stay back for the week a s they tell the headmaster their parents got the dates mixed up. Soon enough, we see there is something very sinister happening at this boarding school. The girls we follow are Joan, Kat, and Rose (Emma Roberts, Kiernan Shipka, Lucy Boynton), who all seem a little bit off kilter as they walk around aimlessly on the school grounds set to creepy music. That’s basically the gist of this movie, unfortunately. 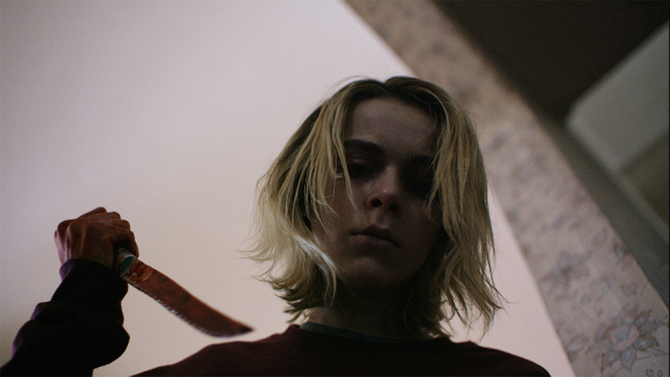 ‘The Blackcoat’s Daughter‘ is a super slow paced demonic possession film that never pays off in the end and has a wonky timeline and uneven editing scheme that ultimately makes the movie confusing. There are some fairly creepy and haunting moments, but they never last more than a couple of seconds and are spaced so far out, that you might forget what type of movie you’re actually watching. It’s a shame too, because there are some excellent actors here too, but the substance is less than thrilling. Towards the end of the ‘The Blackcoat’s Daughter‘, things tend to get a bit more violent, but it’s done in such a cheap 80’s slasher type of way, that it’s almost laughable and not scary at all, which is the opposite of what Perkins was trying to convey here with all of his steely blue and gray exteriors and interiors. ‘The Blackcoat’s Daughter‘ is a very bleak and fairly uninteresting movie, however the score by Elvis Perkins was phenomenal. I just wish this movie had a bit more to it. Film Review: ‘The Autopsy of Jane Doe’! This entry was posted on Saturday, September 26th, 2015 at 8:53 pm	and is filed under Film, News. You can follow any responses to this entry through the RSS 2.0 feed. You can skip to the end and leave a response. Pinging is currently not allowed. « Netflix Gives Us A Glimpse At ‘Jessica Jones’ & She’s NOT A Morning Person!!! Echo station 3-T-8, we have spotted Imperial walkers.